Hawick and Denholm councillor Clair Ramage outside Hawick tourist information centre. Concern has been expressed about Live Borders taking over the running of Hawick’s tourist information centre. The charity is already responsible for the operation of the town hall, leisure centre and other public buildings in the town. Now it’s to take over the day-to-day running of the iCentre at the Heart of Hawick from current operator VisitScotland with effect from March 2019. The move is part of a raft of changes to tourist information centres nationwide, including the closure of 39, among them the current facility at Kelso Town Hall. VisitScotland cites a 58% drop in footfall at its information centres over the past 12 years and the fact that two-thirds of visitors now access information online as its reason for the moves, said to be part of a two-year restructuring strategy. Given the cull of centres nationwide, there is relief that the centre, at the Heart of Hawick, has been spared the axe, but there is also some nervousness at the appointment of Live Borders. 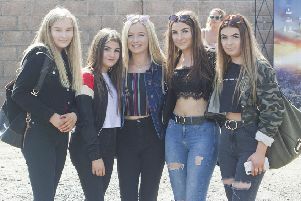 Last month, the charity came under fire over claims that youngsters were placed at risk when staff locked the doors of an exit at the end of an event at Hawick Town Hall. Further concerns centre on the fact that the charity has invited staff to take voluntary redundancy. A trust spokesman has assured the public that “Live Borders will continue to provide information and inspiration for visitors”. Despite that reassurance, Hawick and Denholm councillor Stuart Marshall, independent for Hawick and Denholm, has reservations. He said: “I think there will be a degree of nervousness amongst townsfolk when they hear that Live Borders will now be responsible for the delivery of our tourist information centre, given the fact that only recently this trust was asking for voluntary redundancies, and one certainly has to question as to how much more can be offloaded to this company. “At the moment, Live Borders are responsible for our town halls, museums and galleries, leisure centres and swimming pools, as well as our 3G pitch. Fellow Hawick and Denholm councillor Clair Ramage said: “The Heart of Hawick is very much seen as the main meeting place in Hawick. “It is a great facility for both the local people and for tourists who can find places of interest at the information centre. “Live Borders are now taking over responsibility for the iCentre, and I hope that it is run as efficiently as in previous years.